VENTURA, Calif. — Shane Golobic led a field of 51 drivers by recording the fastest lap in Wednesday’s open practice for the 77th running of the Turkey Night Grand Prix at Ventura Raceway. Four different teams represented the top-four in practice, which all came in the second of the four sessions held. Golobic, a native of Fremont, Calif., took down the top time for Clauson-Marshall/Wood Racing, while second through fourth were held by Brady Bacon of FMR Racing, Spencer Bayston of Keith Kunz/Curb-Agajanian Motorsports and Brad Sweet of Dooling/Hayward Motorsports. The fastest former winner of the Turkey Night Grand Prix was 2015 winner Tanner Thorson, who timed in fifth-fastest overall. Recently-crowned NASCAR Camping World Truck Series champion Christopher Bell, the 2014 winner, was 10th. Bell’s Kunz teammate Kyle Larson — a two-time Turkey night winner — was 13th, while fellow two-time event champion Dave Darland clocked in 33rd. The fastest Don Basile Rookie of the Race contender was Zeb Wise, who timed in sixth-fastest for Clauson/Marshall Racing. Only one incident with contact took place during practice, when Kyle Beilman spun sideways in turn two. Tucker Klaasmeyer clipped Beilman’s car with his right rear tire, sending him flipping over. Klaasmeyer was uninjured and returned to practice, where he timed in 18th overall. On Thursday, the event card includes a full program for the midgets, concluding with a 98-lap feature, plus USAC West Coast/VRA Sprint Car semi-features and their A-Main. Open Practice: 1. 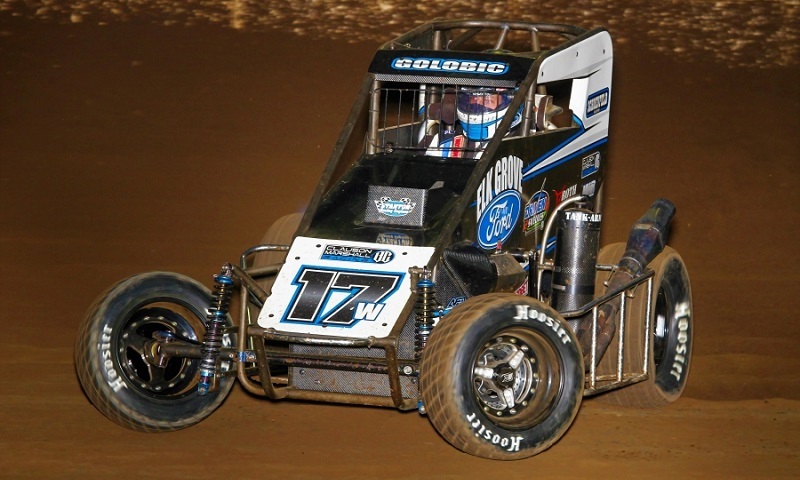 Shane Golobic, 17w, Clauson-Marshall/Wood-12.038; 2. Brady Bacon, 76m, FMR-12.059; 3. Spencer Bayston, 97, Kunz/Curb-Agajanian-12.088; 4. Brad Sweet, 63, Dooling/Hayward-12.095; 5. Tanner Thorson, 67, Kunz/Curb-Agajanian-12.103; 6. Zeb Wise, 39, Clauson/Marshall-12.120; 7. Michael Pickens, 25x, Rodela-12.121; 8. Justin Grant, 39BC, Clauson/Marshall-12.157; 9. Chad Boat, 84, Tucker/Boat-12.167; 10. Christopher Bell, 21, Kunz/Curb-Agajanian-12.169; 11. Logan Seavey, 4A, RAMS-12.189; 12. Tyler Courtney, 7BC, Clauson/Marshall-12.205; 13. Kyle Larson, 1, Kunz/Curb-Agajanian-12.225; 14. Cory Elliott, 11E, Elliott-12.260; 15. Ryan Robinson, 71, Kunz/Curb-Agajanian-12.406; 16. Matt Mitchell, 75, Miller-12.411; 17. Holly Shelton, 67K, Kunz/Curb-Agajanian-12.425; 18. Tucker Klaasmeyer, 27, Klaasmeyer-12.445; 19. Kevin Thomas, Jr., 25, Petry/Goff-12.446; 20. Chase Briscoe, 5, Briscoe-12.449; 21. Dustin Golobic, 17G, Wood-12.452; 22. Michael Faccinto, 9D, Dodenhoff-12.462; 23. Maria Cofer, 57, Cofer-12.484; 24. Carson Macedo, 73x, Ford-12.529; 25. Danny Stratton, 98, Blondel-12.536; 26. Frankie Guerrini, 63, Guerrini-12.543; 27. Courtney Crone, 25, Rodela-12.613; 28. Tanner Carrick, 71K, Kunz/Curb-Agajanian-12.629; 29. Terry Nichols, 1p, Nichols-12.641; 30. Robby Josett, 2, Josett-12.702; 31. Daniel Robinson, 56, Fifty6x-12.740; 32. Tyler Nelson, 47, Mason-12.743; 33. Dave Darland, 73T, Ford-12.745; 34. Cody Swanson, 17, Swanson-12.768; 35. Clayton Ruston, 7R, CR-12.780; 36. Tyler Edwards, 2JD, Shenanigans/Neverlift-12.813; 37. Brayton Lynch, 1K, RKR-12.814; 38. Ronnie Gardner, 68, Six8-12.877; 39. Robert Dalby, 4D, Dalby-12.882; 40. Colton Heath, 99, Heath-12.916; 41. Carson Garrett, 15G, Garrett-12.932; 42. Jake Swanson, 73, Ford-12.941; 43. Kyle Beilman, 31, Beilman- 13.039; 44. Kyle Smith, 55, Smith-13.052; 45. Bryan Drollinger, 71x, Drollinger-13.072; 46. Geoff Ensign, 3F, Finkenbinder-13.117; 47. Randi Pankratz, 8, Pankratz-13.129; 48. Mark Chisholm, 56x, Fifty6x-13.181; 49. Mack DeMan, 9E, Dodenhoff-13.228; 50. Ron Hazelton, 15, Hazelton-13.466; 51. Jake Vermeer, 87JR, Vermeer-13.512; 52. David Prickett, 22Q, Neverlift-NT; 53. Mason Daniel, 33m, Daniel-NT.